While I'm in New Iberia, Louisiana on a mercy mission, I feel grateful to be back in my home for a brief visit, but I'd forgotten about the humidity that smothers me every time I step outdoors. Several days ago, I left a climate of 70 and 80-degree temperatures on The Mountain at Sewanee, Tennessee, and I haven't adjusted to Louisiana heat yet. By the time I leave Sunday, I should be somewhat acclimated but happy to return to cooler climes. However, one of the pleasures of returning to "The Berry," as we call New Iberia, is the opportunity to graze in my library here and read books about Louisiana that I've collected for more than forty years. This morning, I began looking for a book with which to entertain myself rather than search for one that contained historical information as I usually do. 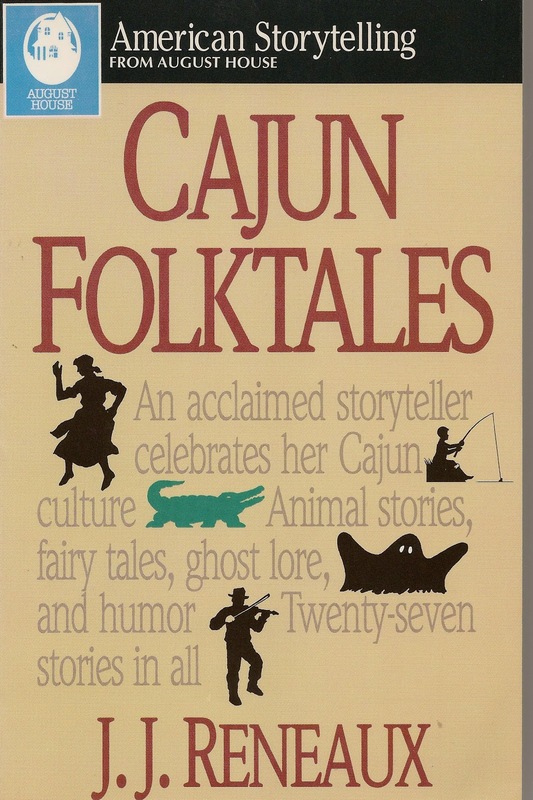 I discovered a book entitled Cajun Folktales by J. J. Reneaux tucked away in a corner with more serious volumes about the history and ethnicity of Louisiana. Jean Sot is a fellow I most enjoy reading about in Cajun stories, but I had never read the one about this foolish character that Reneaux includes in her volume. The story supposedly circulated around Mamou, Louisiana, legendary home of Jean Sot, and was told by Shirley Bergeron, a well-known Cajun musician and songwriter. According to this tale, Jean Sot, who was noted for being not-so-smart, married someone equally foolish and, as Reneaux relates, "their two heads together were twice as foolish as Jean Sot's one moss-filled head by itself." Jean Sot had never enjoyed the benefits of either telephone or electricity, and where he lived people still plowed with mules and traveled by wagon. So when a truck pulled up on property next to Jean Sot's land, and men began pulling long poles from what Jean Sot called a "pick-'em up truck" and digging deep holes to put the poles in, he was puzzled. With ropes and pulleys, the men raised the poles until they stood as tall as trees, a formidable sight for this simple country boy to view. Jean Sot approached the men and asked what they planned to do with the tall poles. The crew boss, puzzled about Jean Sot's ignorance, told him they were going to string some wire between the poles. As they were talking, several men climbed the poles and began stringing wire between what Jean Sot perceived were fence posts. Jean Sot ran off screaming "Aaiiee," and after he reached home, he commanded his wife to start packing. As his wife loved her home, she refused to comply with her foolish husband's request, and when Jean Sot explained that workmen had invaded the property next door to put up huge fences with posts as tall as trees and were stringing heavy wire between them, she scoffed at him. Cajuns, like Missourians, want to be shown the truth, so Jean Sot took his wife to the work scene and pointed at the fence. "See for yourself," he said. "I tell you one thing, Chere, they're not building that fence for no ordinary animal." When Jean Sot's wife saw the fence, she was astounded and shook with fear. She agreed that they needed to get home tout de suite and pack up because they weren't going to live next door "to no giant cows." And the foolish couple moved away from Mamou. Such is the folklore about Jean Sot and his foolish wife. When this story is narrated aloud by an accomplished raconteur, complete with dialogue and hand embellishments, listeners agree that Cajun folk tales are alive with the joie de vivre that is the hallmark of the Cajun culture. 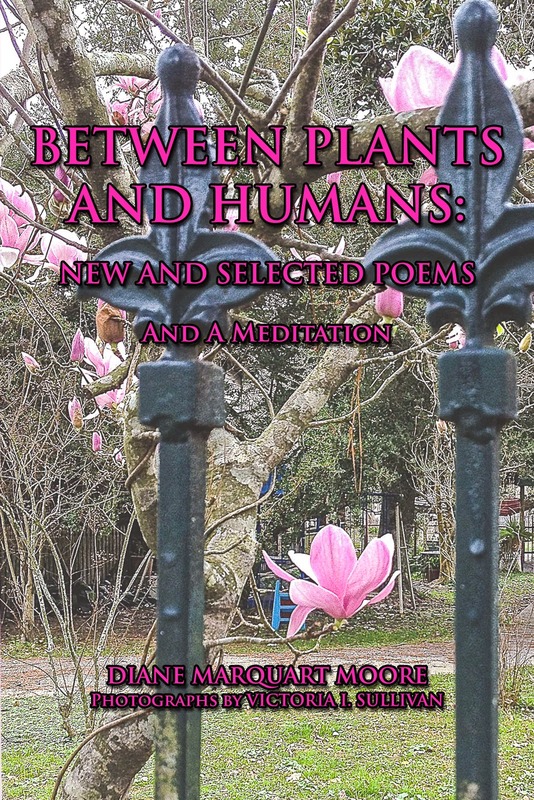 If you're interested in humanistic botany or the inter-connectedness of plants and humans, you might enjoy this latest book of poetry that will be available from Border Press by month's end. The collection is entitled Between Plants and Humans and contains new and selected poems that I wrote about cultivated and wild plants and color photographs by Victoria I. Sullivan, a botanist and writer. The landscape of plants is centered mostly in the southeastern United States, principally in Tennessee, Georgia, Louisiana, and the Carolinas. 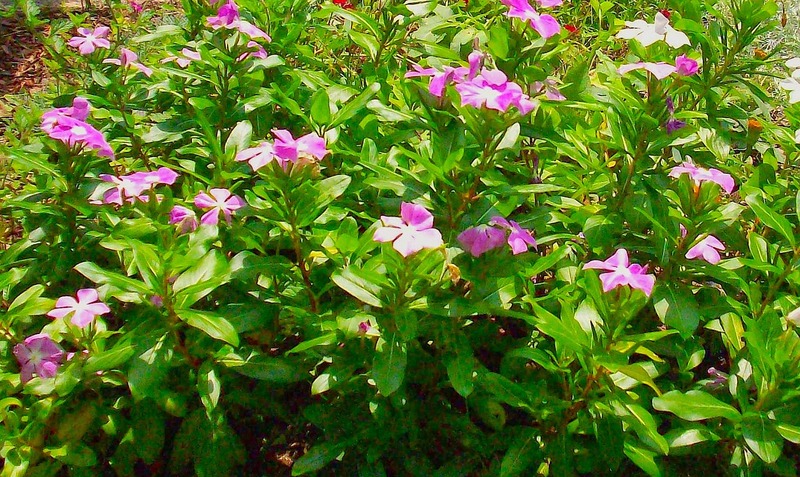 Plants range from Japanese Magnolia to Rapeweed, and my mentions of them are often fleeting but indicative of the inter-relationships between plants and people. Included in Between Plants and Humans is a particularly arresting story in the poem about the pitcher plant, a specimen for which we searched and found on the grounds of the Chattahoochee Nature Center in Roswell, Georgia. Of course, I'm partial to the lovely Japanese Magnolia that flourishes in the lush environment of southwest Louisiana and forms the design for the cover of this new book, shown at the top of this blog. Martin Romero, a landscape designer, did the artistic design work for Victoria's stunning photograph on the cover. Between Plants and People, New and Selected Poems is not a textbook edition about plants, and readers who sometimes attribute anthropomorphic characteristics to members of the plant world should enjoy a stroll through this unusual "garden." Perhaps you'll recognize a few favorites. 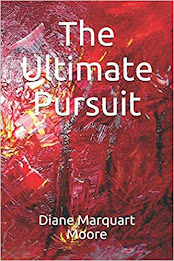 Available in print from Amazon. While reading news on the Net this morning, a bit of trivia sent me into major nostalgia about a treat on which I spent my weekly allowance during the 1940's. The trivia was about the origin of the popsicle, or ice pop, a treat of my childhood when the ice cream cart traveled the neighborhood circuit in Baton Rouge during hot Louisiana summers. For five cents we could buy a frozen orange or strawberry confection on a stick, and if we tired of the flavor, we could switch to a fudgsicle, a frozen, chocolate confection also on a stick. Somewhere in my files of old photographs, I have a photo of me and a friend named Pattie Jo sitting on the front steps of my family home on Birch Street, licking a popsicle and looking down woefully at rivers of orange popsicle melting on the steps and streaking our feet. This morning's news trivia revealed that the first popsicle was made in 1905 when Frank Epperson, an eleven-year old boy, left a glass of homemade soda on his porch during a chilly night in San Francisco, California. The next morning when he went outdoors to get the soda, he found it was frozen with the stirring stick intact. He pulled the frozen soda on a stick from the glass and sampled it, declaring it delicious. The confection was a favored dessert of Epperson, and seventeen years later, he served the treat at a fireman's ball. The popsicle became a sought after treat, so he started a small business, selling them at Neptune Beach in an Alameda California amusement park. 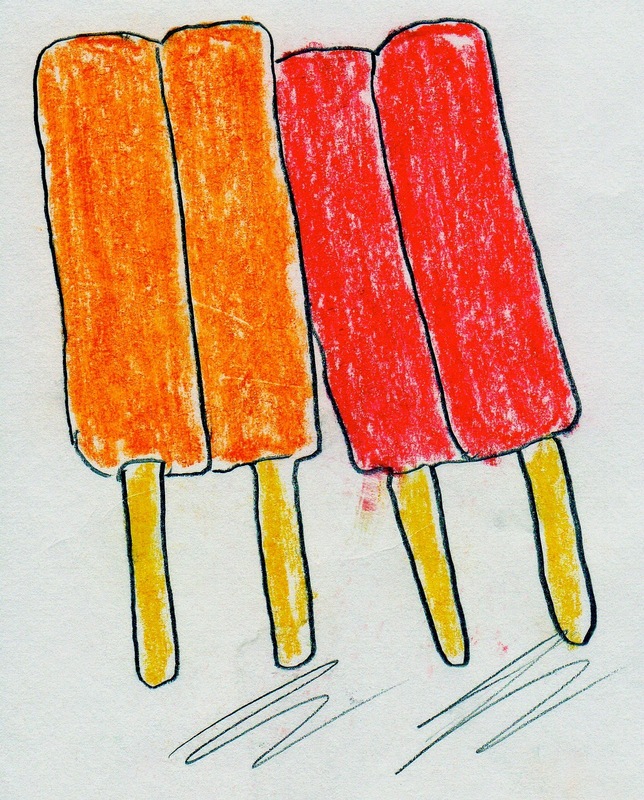 He patented the Epsicle ice pop in 1924, then later renamed it Popsicle. The story doesn't have a happy ending as Epperson sold his rights to the Popsicle to a New York company after he had liquidated all of his assets. Eventually, Good Humor Company bought the rights to this popular flavored ice on a stick, and the ice pop has morphed into many variations of the original popsicle. the sweet indelibility of orange fingers. in the innocent peace of pre-puberty." My version of "when all else fails, do this..." has altered during the past few years. I was once inclined to say that "when all else fails, take a hot bath," but lately I've changed that sentence to read: "When all else fails, plant a garden," or "stroll through a garden" because I believe that flowers/plants have healing and soothing effects on humans. Here on the Cumberland Plateau at Sewanee where I spend spring and summer, we have a small garden that would probably seem negligible as far as gardens grow, but it satisfies my sense of aesthetics and is a soothing sight every morning when I open the back door. 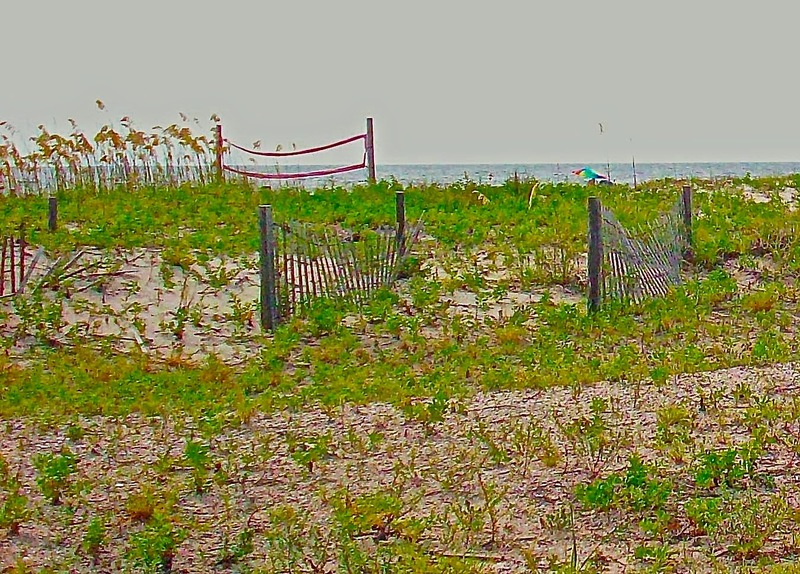 Only this morning, I opened it and spied a red knockout rose blooming against the grey planks of the back fence. Of course, I have a black thumb and could describe my gardening expertise as much like that to which Ogden Nash laid claim: the skills of a "horticultural ignoramus." However, I do appreciate gardens as avenues for feeding the soul. "Of what use will a dish of roses be to thee? Take a leaf from my rose garden. But the rose garden is always delightful." a stark landscape of stone and sand. "Where did all the flowers go?" a few anemones and yellow daisies. enhancing salads at dinner parties. showing off her heart-shaped base. "I didn't promise you a rose garden,"
of yellow and pink blooms. but the same lushness enclosing. The photograph at the top of this blog is a shot of the miniature garden in my backyard, a space where plants nod good morning every day and speak to my condition "when all else fails." If you're foolish enough to look for resurrection fern in a mountain environment, you'll find it isn't an easy search. In fact, finding plants for a botanist to photograph to accompany poems about plants that appeal to this poet's sensibilities calls for travel further south than the Cumberland Plateau in Sewanee, Tennessee. 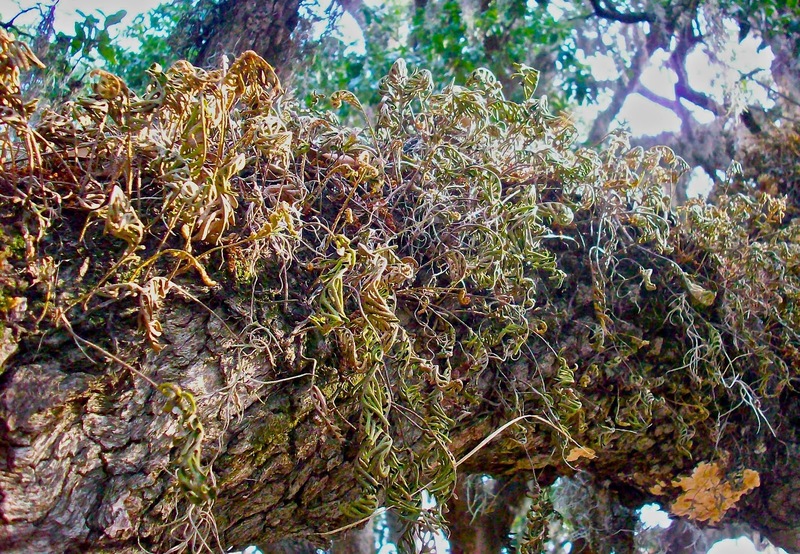 So last Wednesday, we set out for the coastal country near Savannah, Georgia to search for ancient live oaks that were home to the epiphyte, resurrection fern. This city, touted as one of the Top 10 Travel Destinations in America, was really not that far from Sewanee—six hours and fifteen minutes, according to travel maps online, but the maps didn't reckon with the mighty eighteen wheelers that crowded the interstates leading to one of the most beautiful cities in the U.S. When I began thinking about writing a blog featuring a city that inspired films like Midnight In the Garden of Evil—the architecture, history, and, yes, hauntings—I had in mind a romantic piece about a place of hospitality and charm. However, the song of the open road soon soured as we began dodging trucks on the Interstate, especially on I-16, and the congestion leading from Macon, Georgia to Savannah involved many of these big tanks with "Safe and Courteous" written on their tail ends. 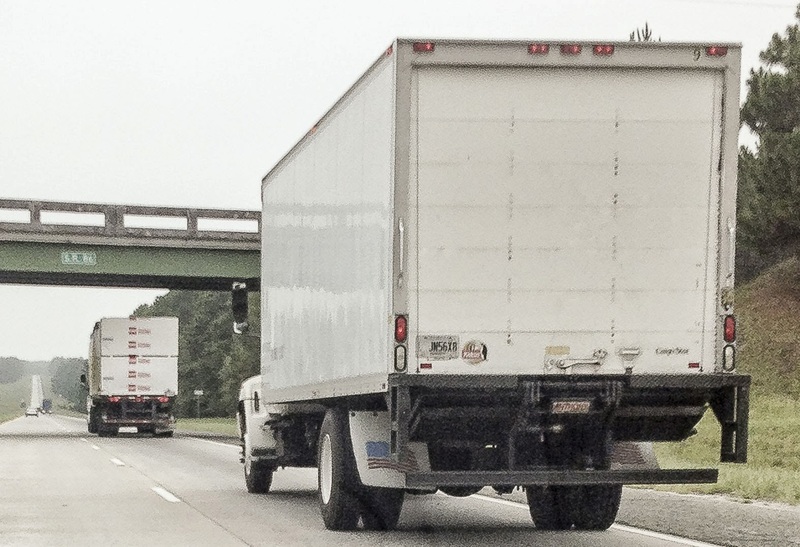 Sometimes their doubling up in both lanes made me fearful for the safety of prisoners picking up trash on both sides of the highway—I wondered how many pounds of peeled off truck tires the sweating men had been hauling off daily. We hit several of these black rubber teeth as we sped along and later had to inflate all our car tires from rolling over the trucks' discards. As we whizzed past, I snapped a few photographs of trucks moving hot and heavy, their red underpants flapping in a breeze they stirred up and mimicking trains by carrying train cars on their flatbeds—oversized tanks with launching ports of Salinas, California, Rushville, Indiana, Mobile, Alabama emblazoned on drivers' doors. The truck traffic near Atlanta was daunting, and ten miles out of Savannah, I lost any respect I might have had for the trucking industry when we stalled for one hour on Highway 16 before turning around and finding an outlet to Hwy. 80, which led into Savannah. We heard reports that earlier in the morning when a heavy fog had made highway travel dangerous, seven eighteen wheelers had crashed and caused a 27-car pile-up... and at 4 p.m., the highway still hadn't been cleared. "Hhmph," I told my botanist friend, 'This vehicle makes wide turns' should be written on the sides of automobiles traveling down here instead of on the rear ends of eighteen wheelers—we're the ones who've had to make wide turns and retrace our route because of their 'safe and courteous driving.'" The above was the beginning of a rant, which is what one of my former associates once dubbed a newspaper column I wrote for the Daily Iberian in New Iberia, Louisiana, but it isn't the first time I've made noises about Jimmy Hoffa's offspring—the mighty trucks that have replaced my favorite mode of travel—trains. Yes, "the open highway" is a phrase of the past and has been replaced by "Where is the next exit?" but we did find the resurrection fern, curled up, in need of resurrection and many rains, in Forsyth Park, a green space that was created in Savannah in 1851. We took photographs of a fern clinging to a 300-year old oak in the private parking lot of the law school across from the park and were chased off by a security guard. As usual, I was doomed to stand in the street before a "closed" sign on Flannery O'Connor's childhood home—her home will be #3 for authors' homes that are usually closed on the days of my visits—the other two being William Faulkner's home in Oxford, Mississippi and Marjorie Kinnan Rawlings' home near Cross Creek, Florida. I think we got lost enough times to view the 24 Squares that are a part of Savannah's charm before we set out for Tybee Island to find the open sea...behind a fence of sea oats! Low Country Georgia's cuisine equals Cajun fare in taste and rich diversity. Backyard fishermen often catch shrimp, crab, oysters, and flounder from backyard docks, and trawlers bring in catches of whiting, mahi mahi, grouper, red snapper, and Spanish mackerel from the Atlantic Ocean. Savannah cuisine carries the flavor of Spanish, French, and West African cooking. On our return trip to Sewanee, farther up the road at the Harvest Moon Cafe in Rome, Georgia, we enjoyed a flavorful dish of collards cooked with onions and apples. We only had three days to savor the "coastal empire," but we advise readers to spend at least a week in this city featured in Conde Nast Traveler, Travel and Leisure Magazine, Southern Living and TripAdvisor.com. However, book a flight when you begin planning the trip! Or better still, board a train!